It’s pretty simple really – I call it “The Reverse Calendar”. In order to achieve success in school, studies have shown that IQ is not the #1 contributor. In fact, an important contributor to student success is a balanced life that allows you to enjoy life while working hard; avoiding the ‘I give up’ syndrome. Start with a blank monthly calendar. You can download one here. Write down all your due dates. Now an important and often missed step: cross out times when you will be doing other things and will be unable to study – things like sports, time with friends, church, time spent on hobbies, time spent at a job, etc. Lastly, working backwards from the due dates, write in what needs to be done each day – things like: read pp 20 – 45 or spend 1 hour proof reading or brainstorm or write an outline. Most people hate that feeling of unfinished tasks hanging over their heads. Not only does the reverse calendar break down large assignments into manageable chunks, life will feel more balanced and you will feel less anxious. Students that plan this way will develop good work habits (while still working hard) and will be less likely to throw in the towel and give up, finding rest at the end of each day knowing that the daily tasks are complete. Posted in Kids, Study Skills, Uncategorized and tagged anxiety in college students, college students, helping my college student, reverse calendar, study habits, successful students, university students. Bookmark the permalink. I was just making a poster for using highlighters and thought I’d share. I will colour, or have my students colour, the code they want. For example, blue highlighter for “important / main ideas”, pink highlighter for “ask” and yellow highlighter for “look up / find more info”. I also made a blank poster for using when doing a research essay. I have my students cut and paste lots of notes. Then, when reading through the notes, students use different colour highlighters to show the different points they will make in their essay. For example an essay about the danger of microwave popcorn could use blue highlighting for points related to the nutrition of microwave popcorn, pink highlighting for the chemicals in microwave popcorn, and yellow highlighting for the chemicals in the packaging of microwave popcorn. Once this highlighting is done in the notes, students can easily write a rough copy, compiling the same colour ideas and putting them into their own words. Posted in Classroom, Study Skills, writing and tagged essay help, highlighting, nonfiction help, strategy. Bookmark the permalink. 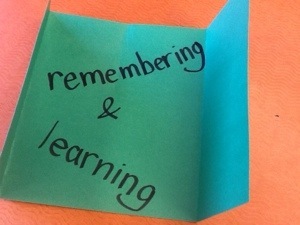 Attention is the key to remembering and learning. 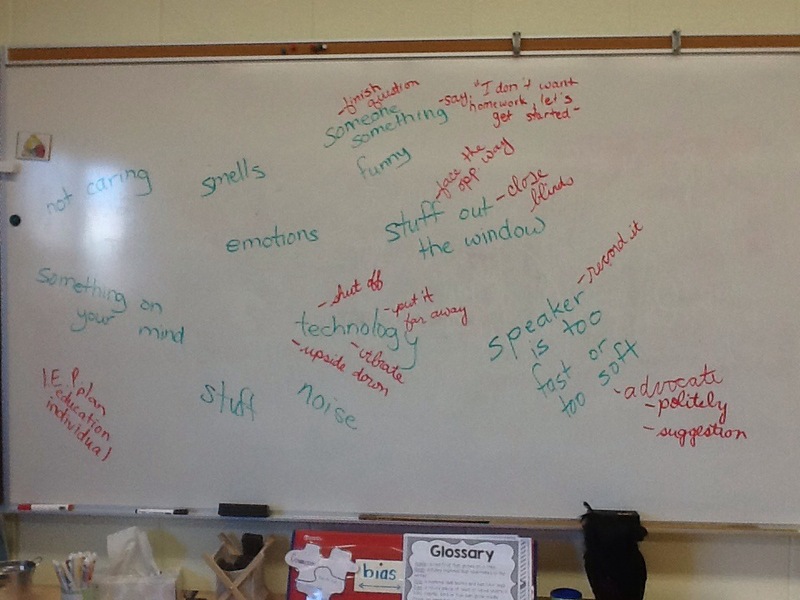 We began brainstorming things that can interrupt attention (in green) and then what we can do about it (in red). I was really excited at the insight shown by my students. I was even more excited when one of them asked if he could take a picture of our brainstorming whiteboard – yay! 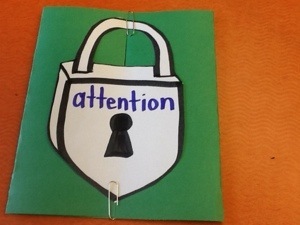 More discussion to come… we are going to focus on how to pay better attention when you feel uninterested or distracted. Posted in Study Skills and tagged attention, metacognition. Bookmark the permalink. 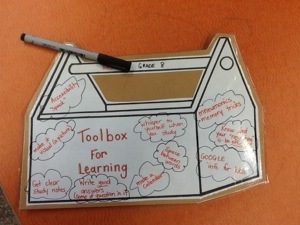 The study skills toolbox is filling up. Many tools…. now, will they choose to use them? Posted in Study Skills and tagged study skills, tools. Bookmark the permalink.